Last year, it was revealed that Yen Press would be releasing Kingdom Hearts 358/2 Days: The Novel on June 19th, 2018, but that date has been moved back to November 13th, 2018. Yen Press first announced plans to publish Kingdom Hearts 358/2 Days: The Novel and Kingdom Hearts Birth By Sleep: The Novel back in 2016. Written by Tomoco Kanemaki and illustrated by manga artist Shiro Amano, the Kingdom Hearts 358/2 Days novel initially released as a trilogy in Japan and provided more in-depth story and characterization to the overall story of the video game. Also, don't forget to pick up a copy of Kingdom Hearts: The Novel, Chain of Memories: The Novel, Kingdom Hearts II: The Novel Volume 1 & Volume 2, and the Kingdom Hearts manga series by Shiro Amano! Is the manga series worth it? Each iteration of Kingdom Hearts holds its own value. The manga is really fun and lively, and also cuts out most of the filler in Kingdom Hearts while weaving a more cohesive story. It also isn't really considered canon. Amano has a great sense of humor, too. The novels are closer to the games, but have a lot of added dialogue and events that really give a nice insight into the minds of certain characters. Tomoco is fantastic at character moments and it really shines in her novels. The novels are closer to being canon due to Nomura's oversight of them. Why was this delayed? Would it be unreasonable to speculate it might have something to do with KH3? My tin foil hat theory is that it has everything to do with KH3. A more logical rationale is that they have a lot of series they are working on and not enough staff to work on all of them, so they pushed it back to focus on other projects. KH III's center of delayness is so big it's starting to fold in and envelope other KH projects. Might get into the Manga series, seems pretty cool. Should I start with KH1? If youâ€™re really interested, Iâ€™d recommend reading all of them. Me, personally, I think they got consistently better in presentation, tone and humor but those first issues arenâ€™t the greatest. The original KH manga is alright, as is the CoM manga (which only features Agrabah lol) but where they really shine is the KH2 and ESPECIALLY the 358 manga. Definitely check out at least the 358 manga. I prefer the CoM novel to the game or manga and still think KH1 is best as a game. I share most of your sentiments. 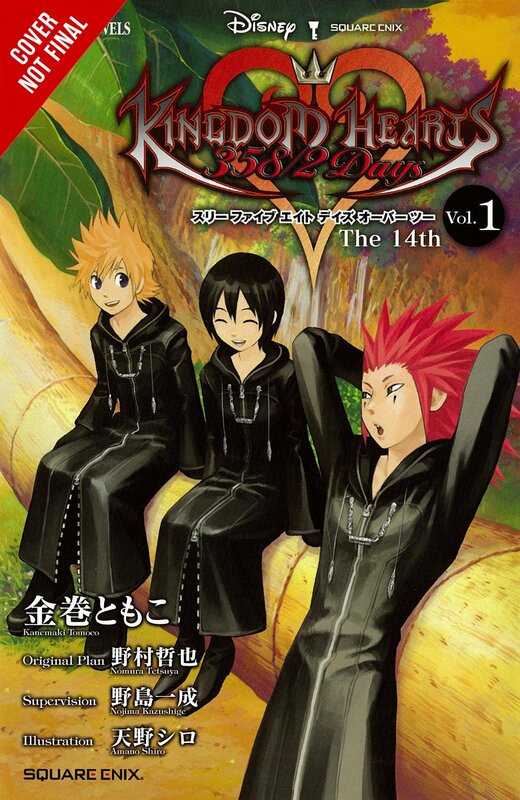 Upon the (re)release of the KH1FM manga, I felt like it was a watered down version of the game, which I probably noticed in TokyoPop's release but forgave this time around due to the "new" pages of content. Still, Amano's quirkiness comes through here and there, and he still manages to tug at your heart with key images that aren't present in the game (King Triton hugging Ariel comes to mind). But he continues to impress and evolve the story in tandem with his creative liberties. Days is truly the brightest star of the bunch. I think most people prefer to digest this liberal telling of the story to the game. KHII and COM hold together pretty well, but I'd rank them in the middle. I think KHII might have been stronger if he had started it all after Days. The same could be said for much of the game series's staggered plot though. I have not made it through any of the novels yet. KH1's is reading like a literal 1:1 copy of the game and coupled with the fact that it's a light novel I'm bored to tears. I hope it takes shape like Amano's work eventually did and solidifies its own identity. It can be canon and still more engaging than what I'm reading. Maybe somebody who's read them all can reassure me. Otherwise, I may go the way of Goldpanner and try to improve my Japanese by reading the imported novels. I'll still support the U.S. releases anyways. Just like the KH1 manga, the novel suffers from it being the first in the series and there being a certain level of fear about diverging from the story. CoM is a huge departure from that hesitancy. The bulk of Reverse/Rebirth is new content interwoven into the original story and it is an absolute treat to read through and untangle. KH2 is even better. Itâ€™s got so many little touches from Kanemaki. She really invests a lot of time giving us more character moments between the characters that drop off the map for 2/3 of the game. It took me awhile to finish KH1 and I had to stop and reread CoMâ€™s chapters to really take it in, but I think I finished KH2 vol. 1 in two nights and KH vol. 2 in a night because they were that much more enjoyable. Considering Kanemaki worked on Days, I imagine it will be some of her best work because she had a hand in making the game. That is all a relief to see! I can suffer through the first one (while trying to cherry-pick any unique tidbits), if it means the others aren't going to be flat. I had kindof been hoping Kanemaki would put her best foot forward, considering Days is a child of sorts, so good to see there's much to look forward to.